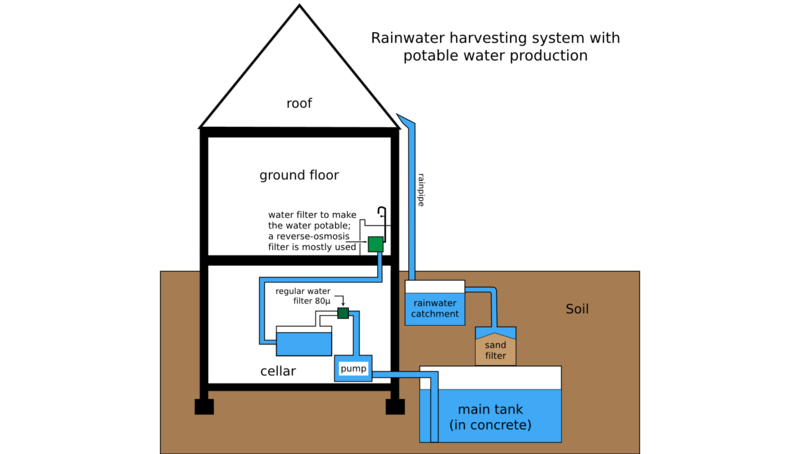 Rainwater harvesting refers to the collection and storage of rain. It is a great alternative supplement to domestic water. Many people use rainwater for irrigation purposes, such as watering lawns and gardens. It can also be used for washing clothes and toilet flushing. As rainwater may be contaminated, it is not suitable for drinking without first undergoing proper filtration and treatment. Rainwater harvesting systems can range from a simple barrel at the bottom of a downspout to multiple tanks with pumps and controls. You can put together a very basic DIY rainbarrel system for as little as £15-20. Disadvantages of rainwater harvesting include the limited supply and uncertainty of rainfall, as well as the evaporation of water from the holding barrel. In most cases, you don’t need any permits to use collected rainwater outside the house (lawn, washing the car, ect). However, many states require that you apply for a permit if you are going to be using it indoors for purposes like toilet flushing. Cubic Feet/Year x 7.43 (Gallons/Cubic Foot) = Gallons/Year.